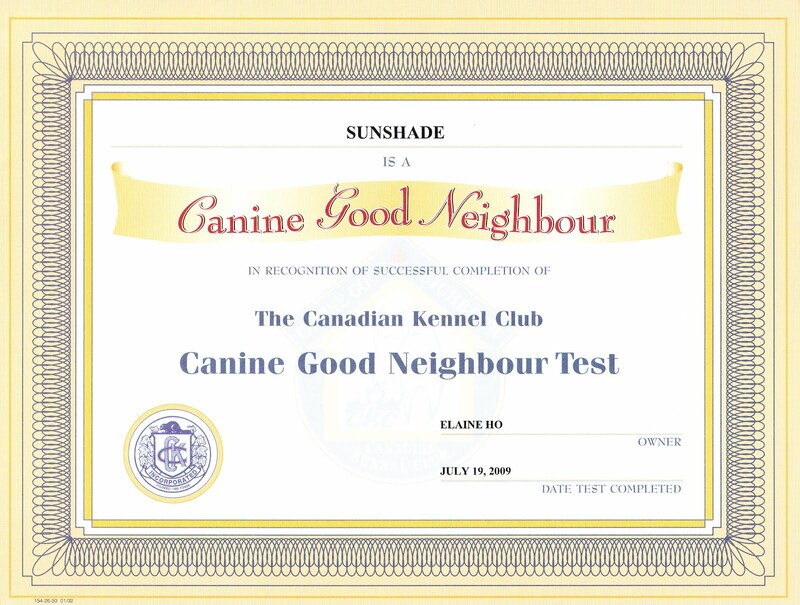 Mum said the test is called Canine Good Neighbour Test (mum: the equivalent of the Canine Good Citizen Test in the US). It is non-competitive and allows dog and handler to demonstrate confidence and control in 12 steps. It assesses the handler and dog's relationship, together with the handler's ability to control the dog. Dogs are evaluated on their ability to perform basic exercises as well as their ability to demonstrate good manners in everyday situations. CGN/CGC is a requirement for most therapy dog programs. to approach and speak to the handler. The evaluator will walk toward the handler and dog and greet the handler by shaking hands and briefly chatting. The dog should remain under control with only gentle assistance, if necessary. The dog should not go to nor jump on the evaluator and must not exhibit any signs of shyness or resentment. This test demonstrates the dog’s ability to allow a friendly stranger to pet it while out with its handler. The evaluator will pet the dog on the head and shoulders. The dog may sit or stand quietly beside the handler and may change position, but must not exhibit any signs of shyness or resentment. This practical test demonstrates that the dog will accept being groomed and examined and will permit a stranger to do so. The evaluator inspects the dog, brushes the dog briefly on the back and sides, and lightly examines its ears and front feet. The evaluator then walks behind the handler and dog, returning to face the dog. Minor movement is allowed, but the dog should not have to be restrained. This test demonstrates the ability of the dog to walk politely on a loose leash as well as the handler’s ability to control the dog. The evaluator will have the handler and dog walk a course, which will include at least one right and left turn and a 180-degree turn. It is not necessary for the dog to be exactly aligned with the handler or sit when the handler stops. The handler may talk to the dog. This test demonstrates the ability of the dog to walk politely beside the handler in pedestrian traffic, while remaining under control at all times. The dog and handler walk through and close to several people. Throughout this test the handler may talk to the dog giving praise and encouragement. The dog must maintain a position close to the han- dler without becoming unduly stressed or unruly. The dog may show some interest in the strangers but should not go to them. This Test demonstrates the dog’s ability to respond to the handler’s commands. The handler may take a reasonable amount of time and use more than one command to sit and down the dog. If required, the handler may touch the dog gently to assist it. Once the dog has responded to both a sit and down command, the handler will decide in which position the dog is going to be left. The handler will then tell the dog to stay and walk forward 6 metres before turning around to face the dog, then will return to the dog. to the handler; the handler may encourage the dog. This test demonstrates that the dog can be easily calmed following a play session or praise. After playing with the dog for approximately 10 seconds, the handler then calms the dog. More than one com- mand may be used, but the dog must display controlled behaviour when told to settle by the handler. The evaluator looks for evidence of a good relationship between the dog and handler. This test demonstrates the dog’s polite behaviour while in the presence of other dogs and handlers. Two handlers, with dogs, approach one another from approximately 6 metres. They stop, shake hands briefly, chat and then continue walking. The dog should exhibit no more than mild interest in the other dog. This test demonstrates that the dog is confident when faced with common visual and auditory distractions such as doors opening, baby strollers, joggers, etc. The dog may express natural interest in the distraction and may temporarily startle, but should not show aggression or fear. One or two barks are permitted and the handler may talk to the dog throughout this test. This test demonstrates the dog’s ability to be left alone with a person other than its handler, while maintaining a calm acceptance of the situation. The handler asks another person to hold the dog and tells the dog to stay. The handler goes to a pre-designated location, out of sight of the dog and waits 3 minutes until called to return by the assistant evaluator. The dog should not show excessive stress by pulling on the lead, or exhibit excessive panting, barking or whining. This test demonstrates the dog’s response to the handler’s com- mands as well as the handler’s ability to control the dog while moving ahead of the dog and through a door/gate. The handler commands the dog to sit and wait and walks through the door/gate, while instructing the dog to follow. Alternatively, the dog and handler may proceed through the door/gate together, with the dog accompa- nying the handler on a loose leash. The dog must not go through before the handler instructs him to do so. I was SO HOT but... anything for mum ya know? Piece of cake! I was PERFECT!!! People loved the SuperHOT SuperDALE!! D-Guy got me a pink congratulatory pressie! I took it to the car and laid down where there was a bit of shade. I swear I was almost going into a heat induced coma!! My official CGN certificate from the Canadian Kennel Club!! They spelled mum's last name wrong btw, that's not how you say her last name BOL! (mum: I was considering doing some therapy work with Sunshade at old folks home, so I looked up the requirements. Canine Good Neighbour was a requirement. 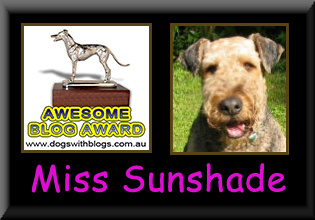 I read the description of the testing and knew that those were things Sunshade had been doing since she was a pup. My Sunshade girl has always been a rather calm, composed girl who listened to me quite well. Anyhow, we headed to the test without having done any practice, and she passed with flying colours even though she was so hot. I knew she could do it!! Fast forward, I ultimately decided not to pursue therapy work with Sunshade because she was just too aloof towards strangers. Sunshade has always been a aloof girl towards people she doesn't know. You almost have to show her that you deserve to be part of the pack, and earn her affection. Once you have earned her approval, you're part of her circle for life. She will love you and protect you with her life. It took 4 years before Sunshade really acknowledged Derek LOL. And it was only after her cancer surgery where Derek helped take care of her did he earn her approval! As you can see from the video, Sunshade is never shy or aggressive, but she also doesn't acknowledge people she doesn't know. I just didn't think she would enjoy therapy work, and I worry that she might make the old folks feel like "even a dog doesn't like me or appreciate me....."
Ewww mum, okay, that's enough! Don't embarrass me on my bloggie!! If you would like more information on Canine Good Neighbour/Citizen test, please click here. I loved your video, Sunshade! You were just perfect at everything! Mom said I could sure learn a lot from you! Hi Sunshade, hey that's really good. Of the four of us, only Owen has actually taken the test and he passed! And he's the most reactive of us.